Cruz’s passion for storytelling has led her on a “journey of soft knocks.” With the youthful dream of being a filmmaker, but without the resources, Cruz’s voyage began with acting (with a short stint as a model). In addition to studying with top-ranked acting coaches and doing theater on both coasts, Cruz also worked in TV, film, and commercial print. “My teenage dream of making movies came true when I made my first short movie: a feminist revenge comedy entitled Pissed. I wasn’t nervous like most first-time directors because I had already spent so much time on the other side of the camera, on sets.” Screened in film festivals around the world, Pissed garnered numerous awards and inspired Cruz to enroll in UCLA’s School of Film with the goal of writing and directing. But after the financial crash of 2008, Cruz needed a plan B: using her experience in cinematography, she stepped behind a still camera and a professional photographer was born. Soon after, Cruz’s life took a surprising turn when she gave birth to a child with Down syndrome, Nathan, now six. Her son’s birth was also the inspiration for her current project, a documentary that examines Down syndrome called What’s Up With Down. Q: What is What’s Up With Down? A: It’s a documentary I am producing to raise awareness of Down syndrome: what it is and what it isn’t, what we know and what we don’t. It’s to introduce this interesting, beautiful culture to the greater society; to educate, change perceptions, and hopefully facilitate acceptance, inclusion, and understanding. A: I became a Solo Mom in 2010 when, at six-and-a-half months pregnant, my relationship with Nathan’s father came to an abrupt end. Q: How did you manage when Nathan was born? A: That’s a good question. I’m still sort of baffled. I was lucky to have a great friend, a very good soul who had an extra couple rooms for us in his beautiful house in the hills. I had loving, fantastic friends who threw me baby showers and came in shifts after I gave birth. I had to start my life completely over, and although I had help with Nathan, I was without money to pay for enough help. It was pretty much Nathan; our dog, Scottie; and me. My back would go out, my shoulder would go out, and to this day two of my fingers don’t work properly. And finances? Ha! There were many times when I had $10 for the week. The first five years were incredibly rough financially. I turned to family for loans and emergency help while building on my skills: photography, my websites, freelance jobs to keep the money flowing—all the while dealing with a custody battle. The good news is Nathan’s father has been a loving father, and today there is peace . . . and we coparent pretty well. A: Yes—in a good way. It catapulted me into working harder than I had ever worked because I’d made a promise to Nathan when he was still in my womb that I was going to make sure he had the best life I could give him. He inspires me to be the best mom, the best person, and the best worker I can be. The fact that I have less time for my work only makes me more productive with the time that I do have. There is definitely no time for slacking. Q: Do you feel your experience solo parenting a Down syndrome child is significantly different than that of any single mom? A: I think it depends on the child and the mom’s circumstances. There is, of course, a lot to learn about Down syndrome. There are more things that take time. But there are extracurricular activities children are doing that Nathan isn’t doing yet—so in terms of extra time, it may be a trade-off. 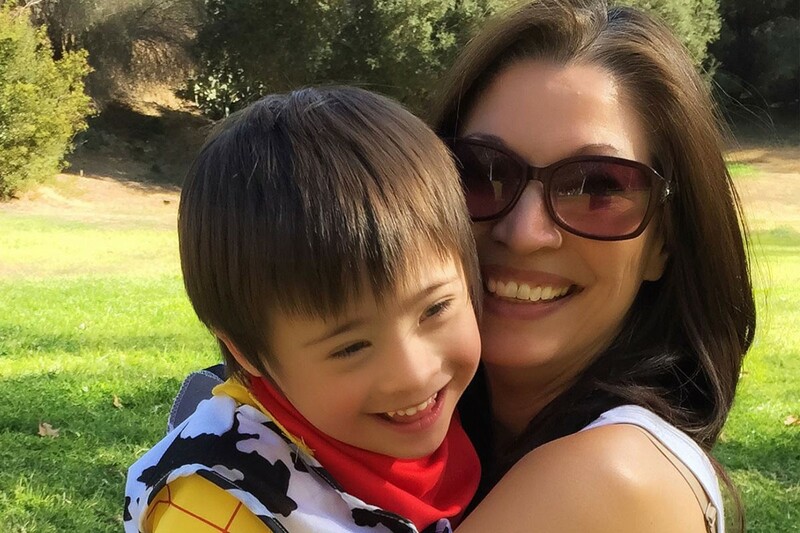 As the parent of a Down syndrome child, I have to fight and advocate for him, which can be frustrating. But so far we’ve done pretty well. What I see and am told is that his classmates and teachers are delighted to have him and are positively affected by his inclusion. He’s a serious chick magnet and has an older brother–type classmate and an aide who watch over him at school. Q: When your status shifted from being a single woman to being a single mom, was there a shift in your community? A: Absolutely. Conversations with friends went from clothes, yoga, guys, and food to breastfeeding, sleep deprivation, cloth diapers, and homemade organic baby-food recipes. For a time, my childless single friends kind of disappeared—but they’ve all come back, and we’re talking about those other things again. With my mom friends, it’s all things kids. Q: As a single mom, of what about yourself are you the most proud? A: That I’ve climbed back up the mountain stronger and more sure of myself, and probably laugh harder now than I ever did before. . . . And sort of kept my figure. A: Slow down. Sometimes it’s OK to stay in pajamas all day on a Saturday.